The world is filled with people of different kinds from all walks of life. And sometimes we don’t really see eye to eye with other people. We can do something that other people might not like, and other people can behave in ways that would annoy us. But there are some things that you just don’t do. A part of living in today’s modern society along with its perks, is being able to follow a certain set of rules that are considered part of a general consensus. And we’re not just talking about the law, which is definitely important to follow (especially if you don’t want to end up in jail and get a face tattoo). We’re talking about those general guidelines that our society has. For instance, it’s usually accustomed that if someone is waiting for a parking space, you’re not supposed to come in at the last moment and steal it. When your co-worker leaves food in the fridge, you don’t just help yourself to their food. These things are meant to keep the order, fairness, and all around curtesy. And sure, not all people follow these rules. Some of them blatantly disregard them as if they don’t even matter! But what happens when these people meet a certain lady called Karma? Well, folks, that’s when they get exactly what they deserve – and it’s hilarious. Don’t you just hate it when people take up more than one parking space? It can be really annoying when you’re looking for a spot and you find someone had parked over three spots with their car. Seriously, the math isn’t very hard to comprehend. If you have one car, you should be taking one parking space, not three! 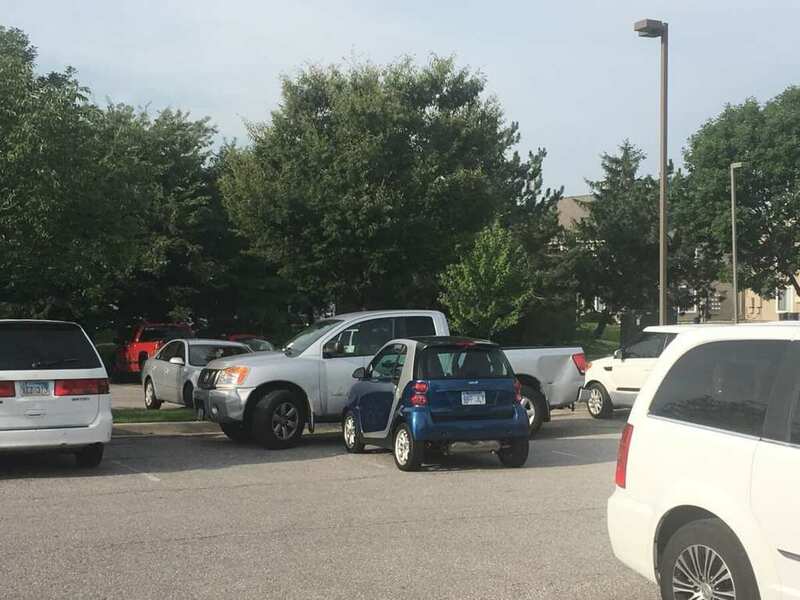 Well, the driver of this Smart car had the perfect revenge in store. They decided they’re not taking any of it, and just went ahead and parked anyway. Since it’s a small car, it could still fit in the parking spot, and the sweet revenge was blocking the car of whomever decided parking like that was okay. We all hate getting spoilers to show we love watching, especially when it comes to a show like Game of Thrones. So many people watch this show, and since it’s pretty much known for killing characters off without any warning (a certain wedding comes to mind), every spoiler can be critical. Some people have been known to cry for getting Game of Thrones spoilers (not us, obviously). So when this guy was unfaithful to his girlfriend, she decided to get back at him in the best way possible. Every Monday morning she sent him Game of Thrones spoilers before he could watch it himself. We can’t think of a better revenge! 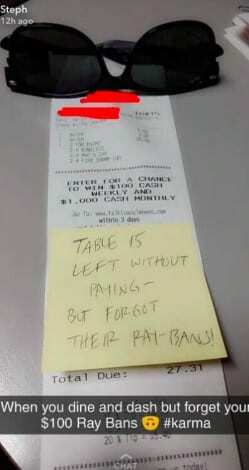 It is never okay to skip out on paying at a restaurant, no matter how small the bill is. The waitress at this restaurant probably felt pretty pissed off to find their customers have left the place without paying their bill or a tip to their server. But then they found the customers also forgot something quite valuable behind – a pair of Ray-Ban sunglasses. You know Karma is at play when you skip out on a $27 bill and accidentally leave your $100 Ray-Ban glasses behind. Have you ever had someone give you bunny ears in a photo? It can be really annoying. You think your picture turned out well, and you didn’t even blink this time when the picture was taken, and then you find yourself with a pair of silly bunny ears. 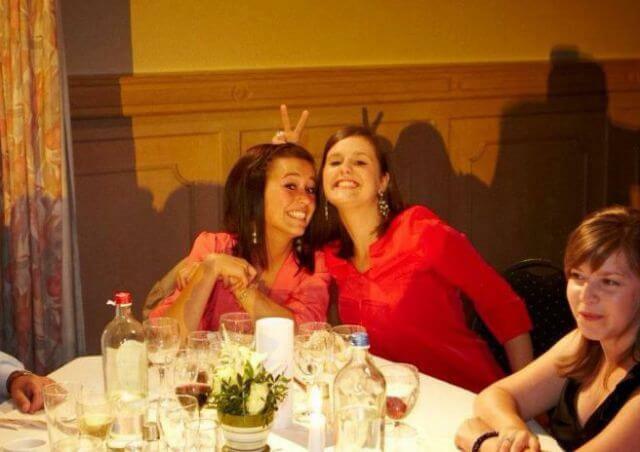 This girl gave her friend bunny ears, and as luck had it – she ended up with some bunny ears of her own, thanks to the lighting in the place. Here’s a lesson about behaving nicely to your fellow human beings, especially in parking lots, and specifically before you go on job interviews. 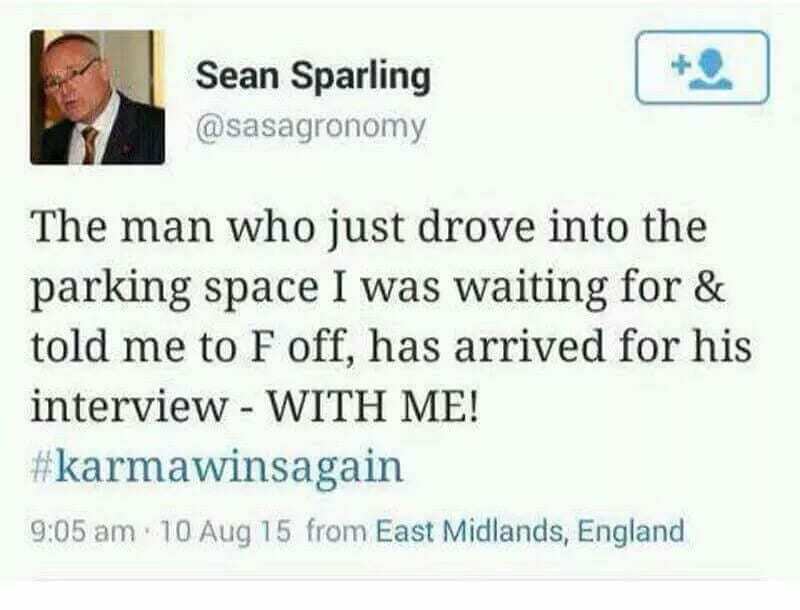 When this man pulled up into a parking space someone else had been waiting for, he probably didn’t think that person would end up being the one who interviews him. Needless to say, this man probably didn’t get the job he was interviewing for. People usually don’t hire people who were incredibly rude to them. It’s always frustrating when your roommate doesn’t do enough around the house. This guy’s roommate never restocked the toilet paper when it ran out, and he was sick of it. So he decided a little payback was in order, and removed all of the toilet paper from the bathroom just in time for his roommate having to use it. 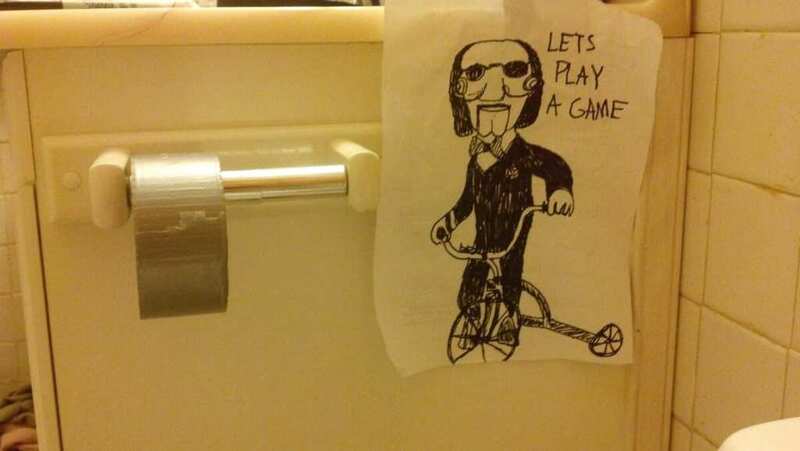 He even left him a hilarious little message taken out of the horror movie Saw. We’re pretty sure his roommate was indeed horrified. Another great rule of thumb to follow – when you accidentally hit another car, don’t run away. Put yourself in the shoes of the person who owns the other car. Having someone crash into your car and just drive away without leaving a note is awful. But whoever owns this car certainly had the last laugh. They were left with a little incriminating piece of evidence, that would lead them straight to the perpetrator who did this. It’s a well-known fact that guys like to prank each other. 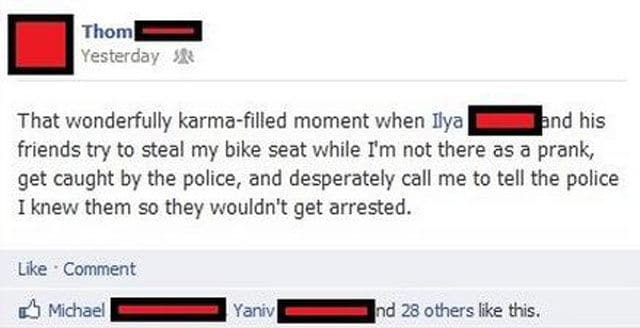 And what could be a better prank than stealing your friend’s bike seat when they’re not there, just to have them freak out as soon as they realize it’s gone? Well, apparently, pretty much anything would be better than that. These guys were caught mid-prank by the police, who thought they really meant to steal the bike seat. They had to beg the person they were pranking to tell the police he’s their friend! Having your phone stolen is one of the worst things that could happen. Your whole life is on it – your pictures, your playlists, and your private messages (it gives us chills to think of anyone reading those). 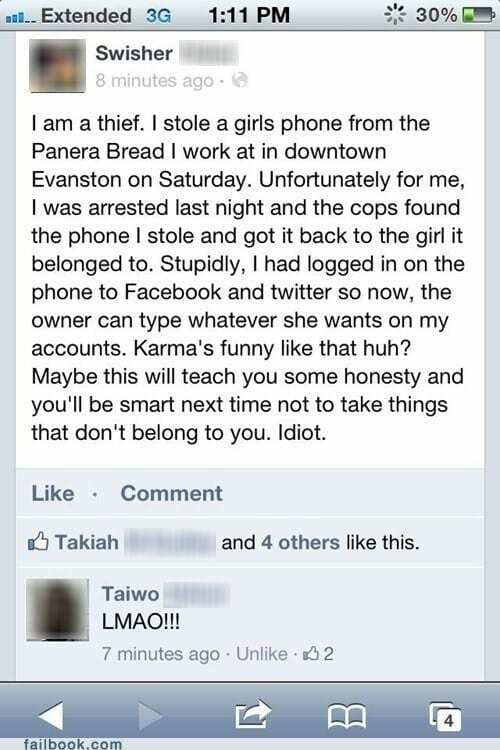 This girl got her revenge on the person who stole her phone, teaching them a lesson they would never forget. Since she got her phone back from the police, and the thief had logged into their social media accounts – she put them to shame by publicly announcing what happened on their Facebook page. 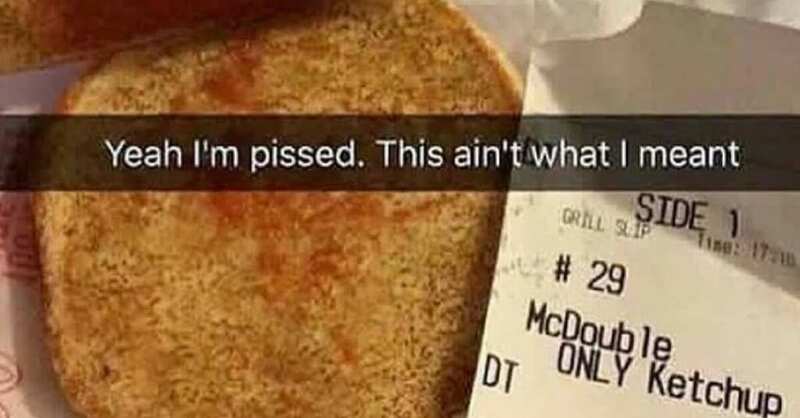 We have to admit, this person didn’t exactly get what they deserved. All they wanted was a hamburger with no veggies on it, but when they ordered a burger with “only ketchup” on it, this is what they got. A bun with nothing in it but ketchup – not even the burger itself. Whoever did this was either not the brightest person, or just pretty darn mean. But we guess that’s what you get when you refuse to eat your vegetables! You’ve got to love these inspirational stories about people who got their revenge on thieves. 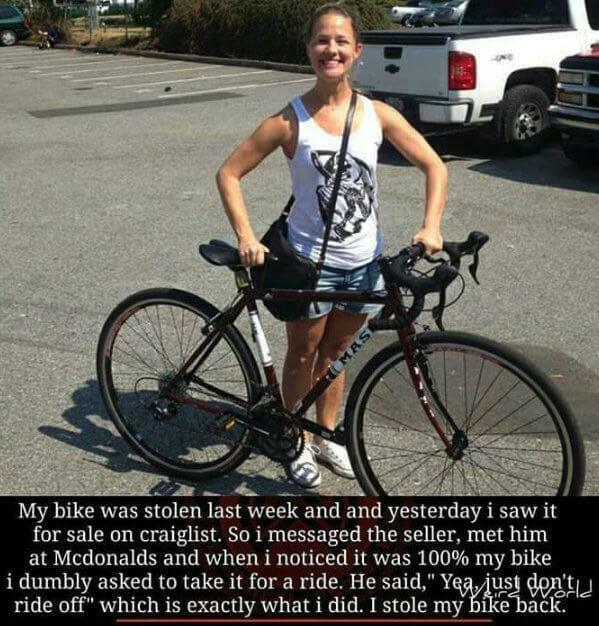 This girl had her bike stolen and then saw it for sale online. How rude! So she contacted the seller and once she knew it was definitely her bike, she just took off with it. You can’t really steal what’s yours to begin with, right? With so many cases of stolen bikes when the perpetrator is never found, it’s nice to see justice served for once. Hitting a parked car and driving off without leaving a note is bad, sure, but this is much worse than that. This cab driver his a person on his bike, and instead of pulling over to see if he’s okay, the driver just kept going without stopping at all. 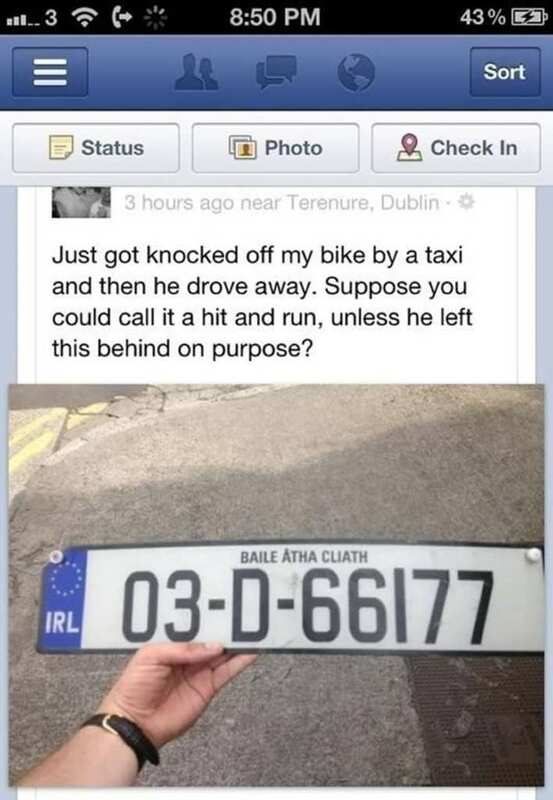 It’s wrong to hit and run, but it made it much better for this bike rider when he discovered the taxi’s license plate had fallen off during it. We’ve already given you one case of revenge on someone who’s been unfaithful, and apparently it’s not an uncommon thing (well, we can see why). 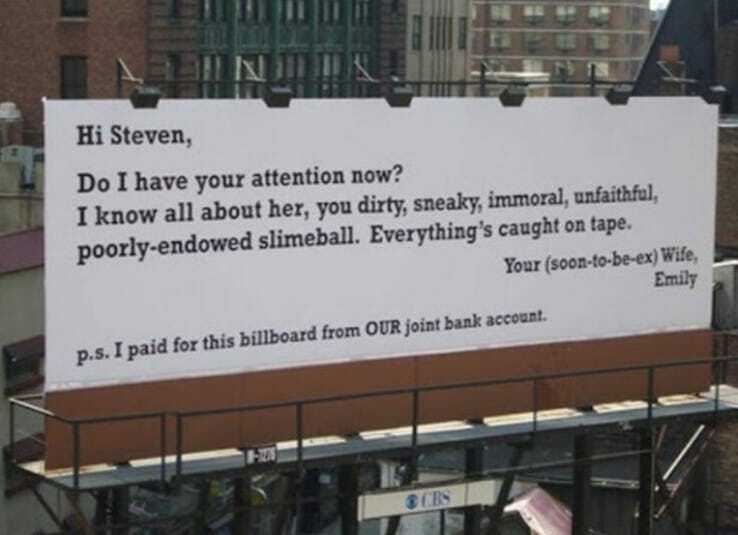 Perhaps influenced by the film Three Billboards Outside Ebbing, Missouri, this woman actually paid for a billboard to send a message to her (soon-to-be-ex) husband. This Steven was probably pretty shocked to find out his wife not only knows about his infidelity, but also advertised it to the whole world. Anyone who grew up with siblings knows a thing or two about sibling pranks. So when this guy’s sister decided to take his $20, she probably should have seen some sort of retaliation coming her way. 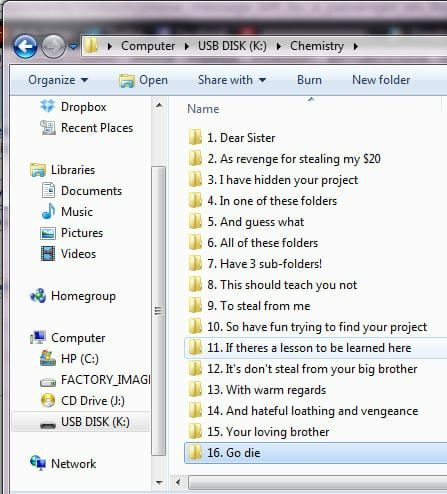 In this case, the clever brother decided to mess with her by hiding her chemistry project inside one of 48 folders on her flash drive. It’s a bit mean, but what’s a little vengeance between brother and sister, right? That office life can get really annoying, especially when your co-workers go around stealing your food and drinks. But it sweetens the deal when you can take a little revenge on your office enemies for doing it. 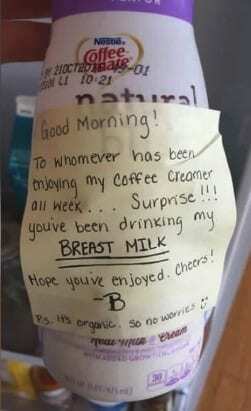 This woman stashed a “coffee creamer” in the office fridge and someone had been stealing it all week. So she decided to let them know they were actually taking a trip down the milky way, and enjoying all that organic milky goodness. 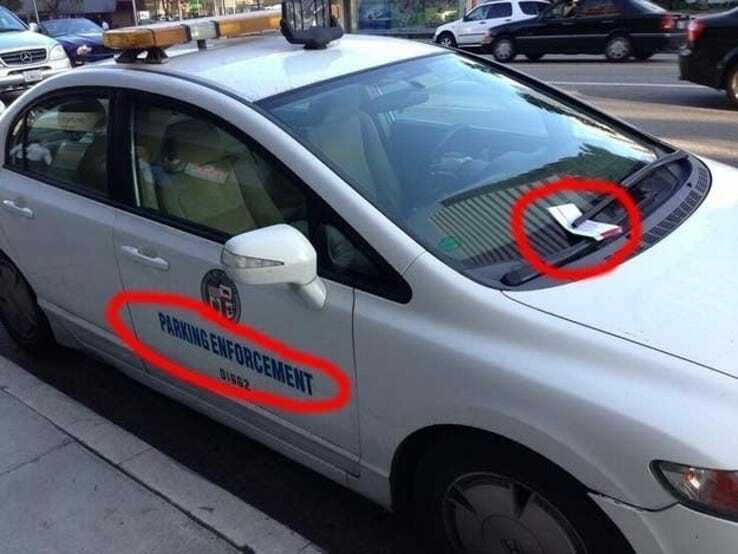 Just because your job is to give people tickets for parking where they’re not supposed to, it doesn’t mean you have permission to park wherever you want. This is what this traffic officer learned, and not in the easy way. You’re probably not doing your job very well if you’re a traffic officer getting a ticket from another traffic officer. Either that, or this officer is the kind of person who steals their co-workers food and coffee creamer at the office. 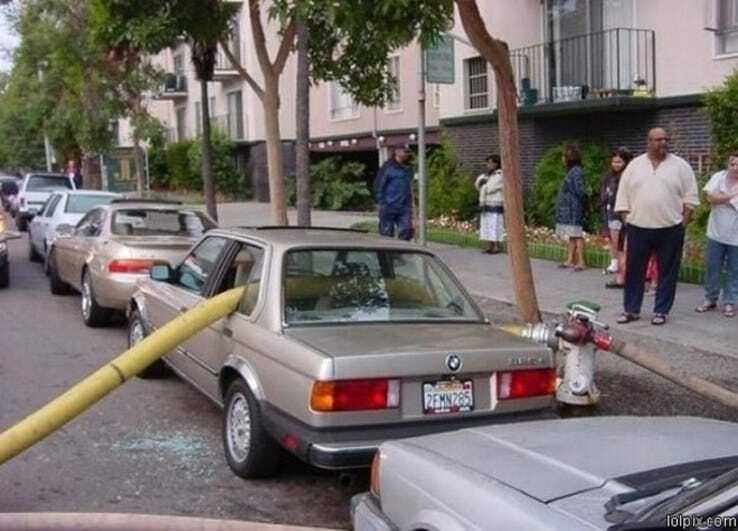 It goes without saying that you really shouldn’t park next to a fire hydrant. In the event of a fire breaking out, fire hydrants are needed in order to put it out. So if you’re parking right next to it, it might create a problem. In the case of this car owner, the problem was all theirs – because the firefighters just broke through the windows of their car to use the fire hydrant. 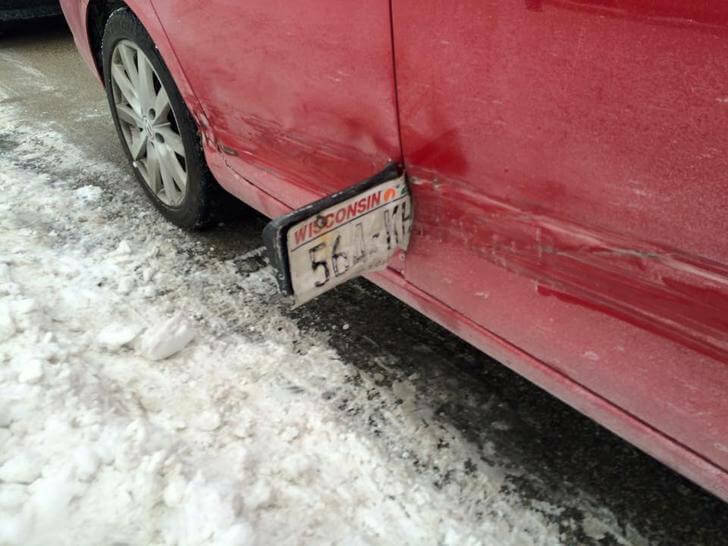 Tough break, but maybe next time don’t park where you shouldn’t? Sometimes, people with fancy cars think they just own the road. You can often see some of them speeding, parking in two parking spaces, and stopping their cars where they shouldn’t be stopping. This guy thought he was taking a quick shortcut, while completely ignoring the cones and warning signs, and got himself into a bit of a sticky situation. 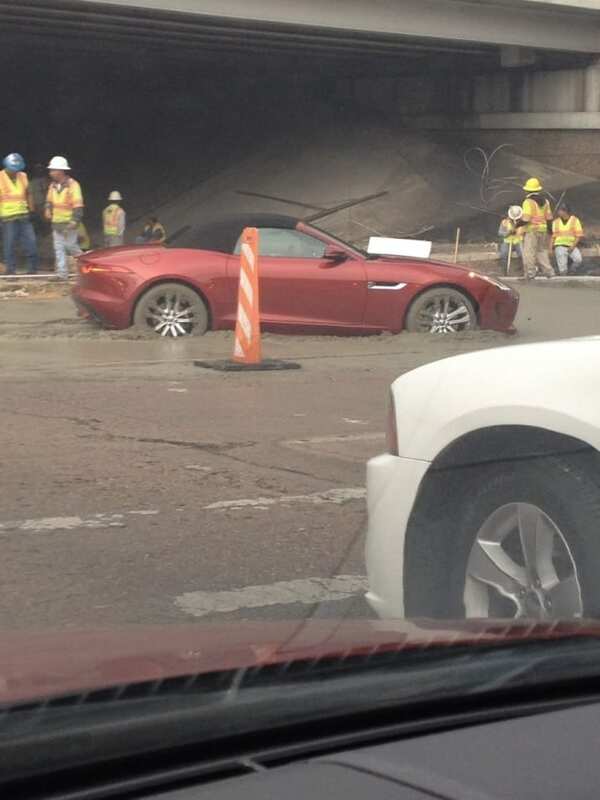 Don’t worry, dude, your convertible car still looks amazing while it’s stuck in the mud. This is another person who thought they’re above the law, and decided to park their car right where they shouldn’t have. It’s clearly interrupting the construction workers do their jobs, but they didn’t let it go over without taking action. They just surrounded this person’s car with heavy, hard-to-move bins. 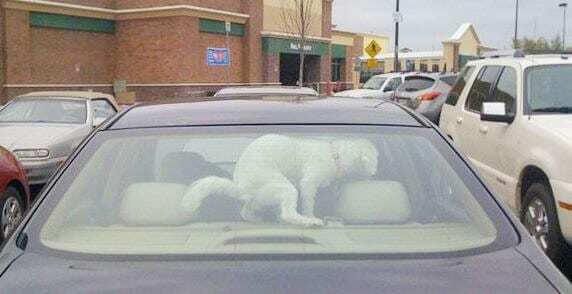 This definitely made this car owner’s life harder when they wanted to get back into their car and drive away. Hopefully, the lesson was learned.